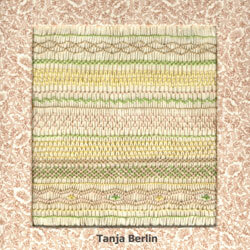 Hi my name is Tanja and I work in many fields of hand embroidery. 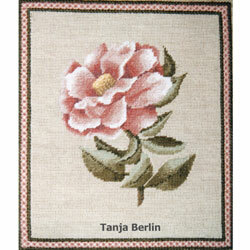 I am the designer, stitcher and author of the designs that you find on my website. I also teach hand embroidery classes in person and on-line. I am fortunate to have had a good foundation in art and design and stitching before establishing my career in the year 2000. 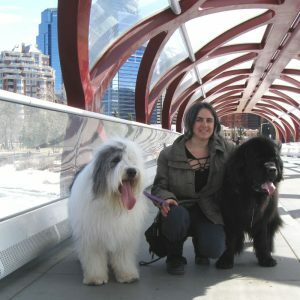 My husband and I reside in Alberta with our three fluffy dogs. 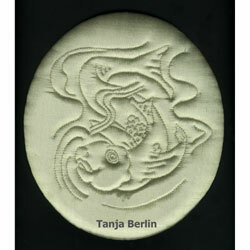 Following is some information of my stitching life and adventures and my aspirations for the future. I had a fairly sheltered upbringing, living in the country side of Dorset with my Mum, Dad and my fun sister – Jess. 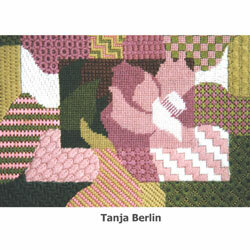 Surrounded by countryside and wild-life was an inspiration for me, I enjoyed art, roaming the countryside sketching, My mother – Beppy Berlin is a needlework designer and teacher so at home I was working on stitching or craft projects. My Dad always encouraged and admired my work. On my father’s side of the family my grandfather – Sven Berlin was an artist for his entire life and my fathers sister Greta Berlin is also an artist who paints, sculpts and welds. In 1999 I attended a one year foundation course in art and design in which I tried many different aspects of art and specialized in textiles. In my school years I was very good at realistic art work and needlework but the style of art and textiles, at art college was far more contemporary and it did not suit my strengths. The foundation course in art and design was a good experience to find out what technique I wanted to continue to do and I decided that perhaps restoration should be my field as it would suit my exacting nature in art. When researching more into restoration I found out that I did not have the requirements for restoration as I needed a degree in Chemistry for cleaning the textiles but the research took in another direction. I was referred by Victoria and Albert Museum to the Royal School of Needlework which had at time a three year apprenticeship course in hand embroidery which is where I went next. 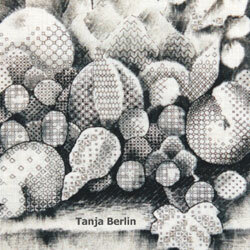 I started my training in all aspects of hand embroidery in 1990. 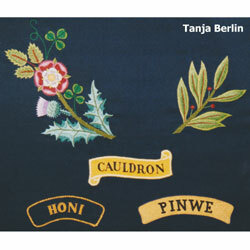 The first two years of the apprenticeship course was split into modules of learning different hand embroidery techniques or working in the work room on commission work, restoration and conservation. The third year was spent entirely in the work room. I completed the apprenticeship with high honours and then stayed a further two years working on restoration, conservation and commission embroidery pieces. Part of my work experience was teaching at the Royal School of Needlework and teaching at guilds in the UK. 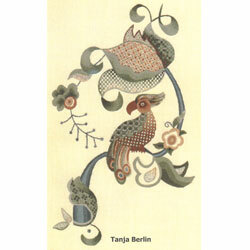 Below are pictures of the embroideries that I stitched during my apprenticeship. Stitch Sampler: First project I worked at the RSN learning different surface embroidery stitches – set design. Canvas Stitch Sampler: Worked in Appleton crewel wools on 18 count mono canvas. 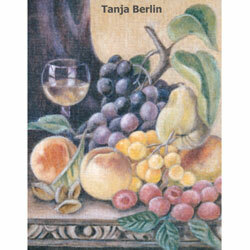 Painted Canvas: Class for painting and wool matching. Canvas Work: Natural shading with Appleton’s crewel wool, worked from a photograph. English Quilting: Padded with batting and worked in back stitch. Italian Quilting: Soft cord woven between two rows of running stitch, the silk fabric and backing fabric. Smocking: Traditional smocking, learned for repair jobs in the workroom. 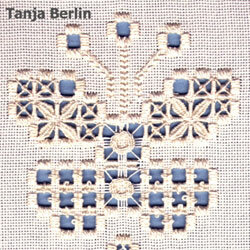 Hardanger: White perle cotton worked on Hardanger fabric. 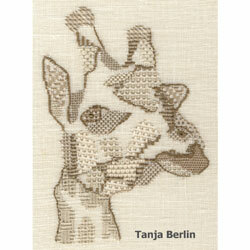 Pulled Work: Giraffe worked in pulled work stitches with DMC cotton threads. Drawn Thread: Stitches worked in DMC cotton threads. 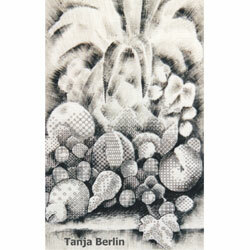 Blackwork: Still Life background painted first and then fruit worked in blackwork patterns. Blackwork: Blackwork Still Life close up. 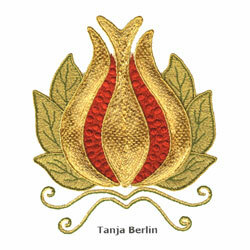 2-Sided Embroidery Front: Perle cotton threads worked on one piece banner silk – set design. 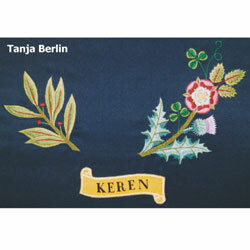 2-Sided Embroidery Back: Perle cotton threads worked on one piece banner silk – set design. 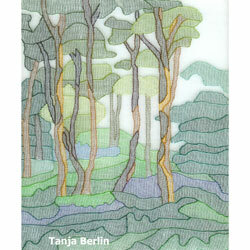 Shadow Work: Forest worked in Herringbone Stitch. 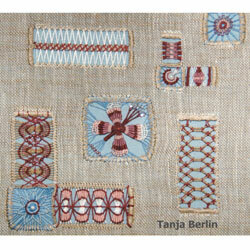 Modern Shadow Work: Applique and herringbone stitch and machine embroidery. 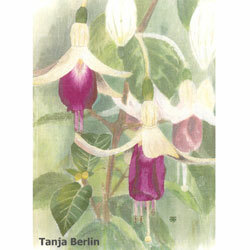 Long and Short Stitch: Fuchsia background hand painted and flowers stitched in silk threads. 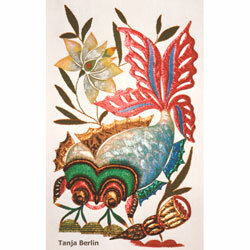 Goldwork Pomegranate: Goldwork embroidery – set design. 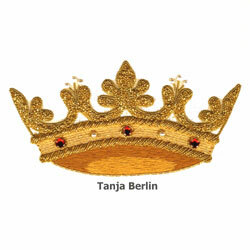 Goldwork Crown: Goldwork embroidery – set design. 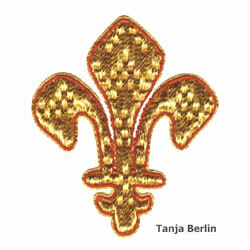 Goldwork Fleur De Lys: Goldwork embroidery – set design. 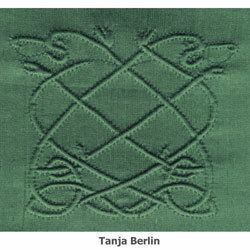 Jacobean: Surface embroidery stitches worked in Appleton’s crewel wool on Jacobean linen twill fabric. 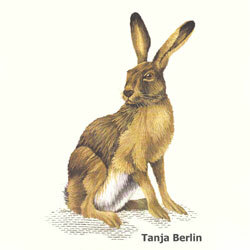 Long and Short Stitch Hare: Hare worked in DMC cotton threads. 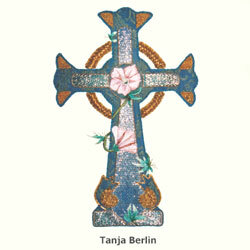 Cross: Cross worked in applique, goldwork and long and short stitch. 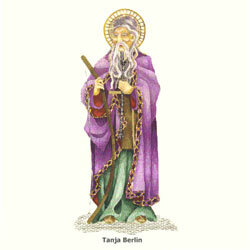 Saint: Saint worked in tapestry long and short stitch in DMC embroidery cotton threads. Applique: Applique worked by hand and decorated with surface embroidery stitches. 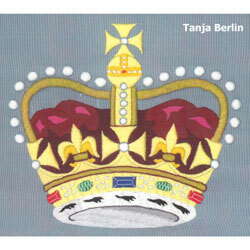 2-Sided Embroidery Front: Crown worked in perle cotton on banner silk – set design. 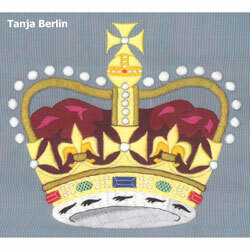 2-Sided Embroidery Back: Crown worked in perle cotton on banner silk – set design. 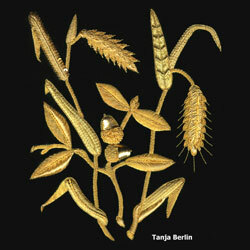 Goldwork: Goldwork wheat and acorns – set design, training for coronation robe. After five years at the Royal School of Needlework I had reached saturation point with stitching. It is quite intense to stitch 5 days a week, 7 hours a day and often more in the evenings and weekends when I was working on commissions. My mind needed a break. So I purchased a a plane ticket and went on a 2 1/2 year traveling trip (was intending it to be a year but it was too much fun). I traveled through Thailand and Malaysia. Worked 8 months in Hong Kong as a bar tender. Traveled to the Philippines and then to Australia.. Met an guy in Australia and continued traveling together hitchhiking and picking and packing fruit. Went to New Zealand, purchased a small camper van and traveled and worked thinning apples and picking asparagus. 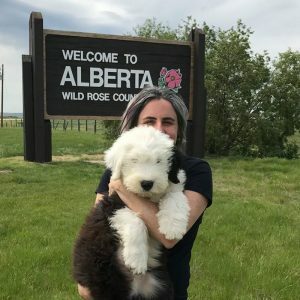 Sold the camper van and flew to California, traveled up the west coast of the USA and finished in Calgary Canada where I an now settled with my traveling companion and now husband – Russ. 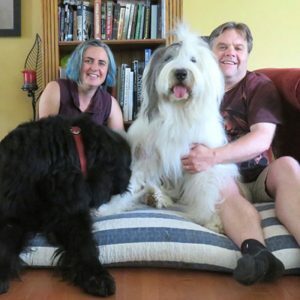 Once Russ and I were married I visited the stitching stores in Calgary and showed them some of my stitched work and found out that most of my embroidery techniques that I teach were unheard off by many stitchers or very little practiced in Canada. I also discovered that the students were enthusiastic to try these new techniques. I started designing and teaching projects at the local stitching stores. As I became more well known I started teaching at embroidery guilds around the country and at retreats and seminars. 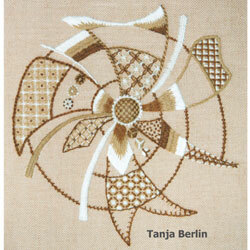 In 2000 I developed my website – Berlin Embroidery Designs to sell my designs. In 2004 I went on my first international teaching trip and taught at the Embroiderers Guild of America National seminar in Minneapolis. I have been very fortunate to have the opportunity to teach at many locations across Canada, USA and Australia at local guilds and at seminars. As the list is long and can be a blur of names and locations I have listed below just the national and international seminars that I have taught at, may be you took a class from me or from one of the other fabulous teachers at these fun stitching gatherings. Over the last couple of years I have slowed down on my national and international seminar teaching trips as I was finding I did not have enough time to design new embroideries and I was getting very tired with the constant preparing to travel and travelling. 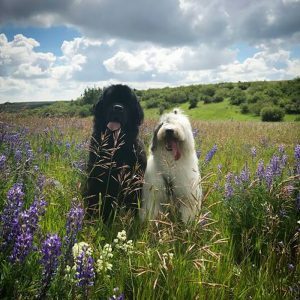 I am teaching more on-line classes which allows me to stay home and be with my husband and my fluffy dogs. And just in case you wondered if I am still doing adventurous things, I sure am. Since being in Canada I have hiked the West Coast Trail, I have learned to downhill ski, been on a 10 day canoe trip in Wells Gray provincial park. 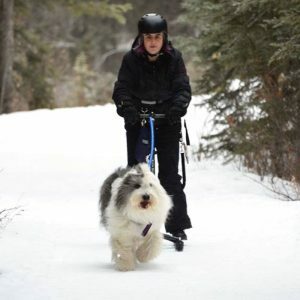 Been back country hiking and camping with the dogs and enjoyed kick-sledding with my dog Monty. 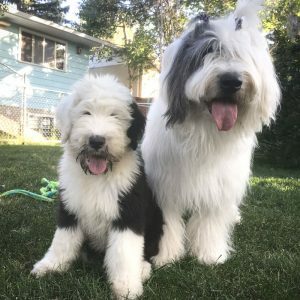 I am now involved in dog agility – training my two Old English Sheep dogs and doing competitions. i want to continue to design new hand embroidery designs that are fun to work and a pleasure to view and develop more on-line classes. I hope you find things that you love to do and if working some of my designs is part of your enjoyment I will be very happy as I have had fun designing them for you to work. Below are publications of my work. The Goldwork Sampler was featured in the Embroiderer’s Association of Canada magazine ‘Embroidery Canada’ and the passing design and heart design featured in the Inspirations Embroidery Magazine by Country Bumpkin Publications. 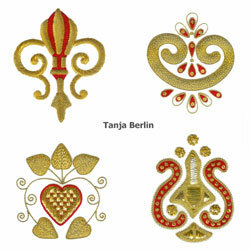 The Goldwork Sampler instructions are now free on my website, I also carry a kit of supplies for the sampler. 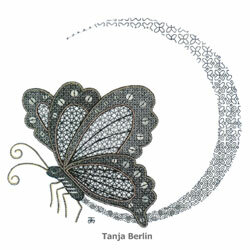 The Blackwork Spectral Butterfly design was featured in the Inspirations Embroidery Magazine by Country Bumpkin Publications. You can now purchase the kit or instructions from my website. 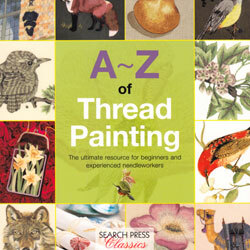 I have one beginners design and four advanced needle painting designs featured in the A-Z of Thread Painting book. You can purchase the book from my website. I have the Goldwork Fleur De Lys design and the Plate Design featured in the A-Z of Goldwork by Country Bumpkins Publications. 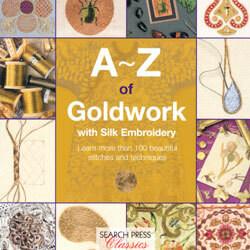 You can purchase the A-Z of Goldwork book from my website.